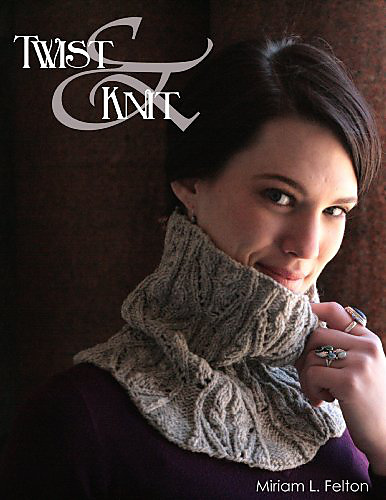 This pattern is published in Twist & Knit: A Dozen Knitted Patterns for Handspun, Hand-dyed and One-of-a-kind Yarns.. 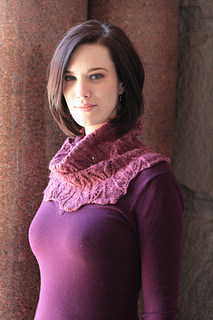 This pattern is also included in Twist & Knit Digital Collection #3. 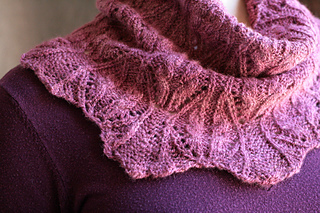 The burgundy version is knit with 283 yards (4 ounces) of handspun Spunky Eclectic BFL Roving (100% Blue-faced Leicester wool) in ‘Red Maple’; 12 wpi on 4.5mm (US 7) needles at 20 stitch and 25 rows over 4 inches (10 cm) in Chart 2 relaxed after blocking. The finished size is Pinned out to 27 inches circumference (69 cm) at top and flared to 34 inches (86 cm) at base. When unpinned, the piece relaxes to 24 inches (61 cm) flared to 32 inches (81 cm) at base. Stitches Used: knit, purl, k2tog, yo, ssk, p2tog, c2 over 2 right, c2 over 2 left. 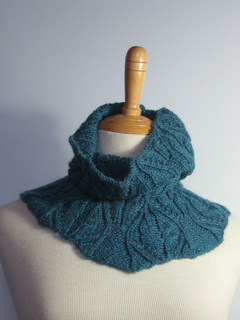 Other Details: This cowl is worked in the round from the bottom edge, decreasing to form a flared base to fit around the shoulders. 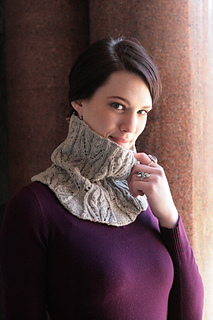 The cowl is continued until you either run out of yarn or the desired length is reached. Instructions are given for two sizes – 18 inches unpinned and 24 inches unpinned. For each of these target circumferences, use the cast-on number given for your gauge in the table. If your gauge does not precisely match the gauge in the table, adjustments to the final circumference can be made during blocking.